Lev Parikian is much in demand as Guest Conductor with orchestras throughout Britain. He is Principal Conductor of several London-based orchestras, and Artistic Director of the Rehearsal Orchestra. 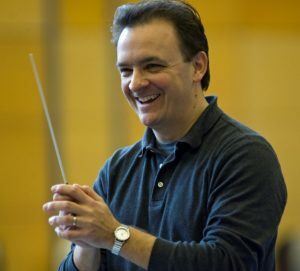 He has worked extensively with students and youth orchestras, including the Royal Holloway University of London, where he also taught conducting for many years. Lev conducted the BBC Concert Orchestra in a rerecording of the theme tune for Hancock’s Half Hour, recently discovered episodes of which were recently broadcast on BBC Radio 4. Lev studied conducting privately with Michael Rose and David Parry, and at the Canford Summer School with George Hurst. He then pursued his studies at the St. Petersburg Conservatoire with the great Russian teacher Ilya Musin. Disappear?, a woeful tale of atrocious birdwatching, will be published later this year with Unbound. Lev lives in South London (someone has to) and his hobbies include muttering at passers-by, cutting you up at the traffic lights and removing unexpected items from the bagging area.